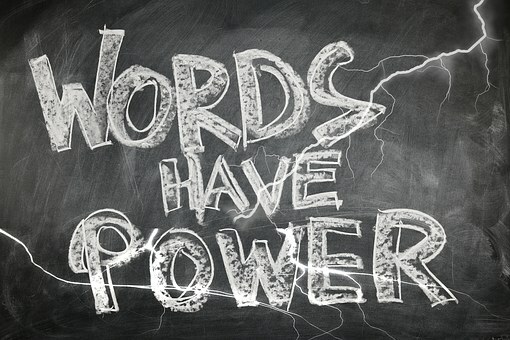 Have you ever wondered at the power of the words you speak? Or even the thoughts you think? Does it really make a difference what you say out loud or under your breath if the only person who hears them is you? When I was a kid we used to take flashlights and intentionally point them up into the vastness of the dark night sky and then remark how that beam of light we just sent out was going to go on forever and ever. Who knew who or what would receive it. It’s a pretty cool concept if you think about it. Some planet light years away receiving a single beam of light eons from now. Spoken words do the same thing. They are just sound frequencies that go out into the universe and then travel forever and ever. Who knows who might be receiving them. Who knows the effect those combinations of frequencies will have years from now. When you are alone with just YOU as your company – such as when you are waking up or falling asleep, sitting on the toilet, taking a shower, driving in your car – what kind of frequencies are you beaming out into the universe with your thoughts and words? Are they positive or negative frequencies? If you put intention behind your internal conversations what would you like the universe to know about you and your future? Here’s an inspiring story to illustrate the power of words when put out into the universe with intention. There once was a boy named Jim. Jim had a difficult childhood. He did poorly in school because he was terribly dyslexic. He overcame this disability partly by developing a really good memory. He had no friends as he was thought of as the weird kid and was pretty much a social outcast except when he tried to make them laugh for that was his talent – making people laugh. He had a natural gift for creating outlandishly humorous facial expressions and voices. Jim’s first actual appearance on stage however did not turn out so well. Instead of laughter, he was, in fact, booed off stage. He was only fifteen years old performing a ventriloquist act at the Yuk-Yuk Comedy Club in Toronto. But this experience did not dissuade him. He knew in his heart he had talent for bringing joy to people and making them laugh and thus feel better, even if just for a few moments. Somehow he just had to figure out. When he was sixteen years old his dad lost his job and Jim had to drop out of school and get a full time job to help support the family. There was even a time when his family was homeless and living out of a yellow Volkswagen van. Despite these hardships he never gave up his dream of being on the big stage and he kept that dream alive in his heart. When he was seventeen he returned to the Yuk Yuk theater with a new act which gained him rave reviews. Now with a little experience under his belt he followed his heart and moved to California to pursue his career as a comedian. The move brought about its own hardships. He found himself again struggling financially, penniless and barely scraping by. Night after night he would drive up Mulholland Drive thinking about how successful he would be one day and then he would speak this intention out loud to only the stars of the universe as his audience. He would speak about all the movies that were already coming his way and the joy he would experience at making people laugh. Whether he knew it or not at the time, he was using the power of words. He intuitively knew he needed to have intentional thoughts about what he wanted the future to look like. He even wrote himself a check for $10,000,000, writing in the memo “for acting services rendered.” He dated it Thanksgiving day, three years in the future. He carried that check in his wallet for the next three years. The words he spoke out to the night sky every night up on Mulholland Drive had power beyond even his wildest imagination. He ended up landing the back up act for Rodney Dangerfield at the Comedy Club in LA. From there it was on to bigger and better parts and eventually roles in movies that did indeed earn him more than the $10,000,000, the amount he had originally contracted the universe for. Who was this awkward, dyslexic boy and at times a penniless man? You would know him now as Jim Carrey, one of the most successful and beloved comedians of our day. What words and thoughts are you sending out into the universe each day? Are you beaming out positive or negative signals? What do you believe is possible in your future? Tell the universe, using the power of your words what your intentions are and then allow life to unfold beyond your wildest imagination. This is a wonderful reading, thank you for taking the time to write it. It reminds me that all I need to know is what I would like my life to be like… be patient…..and trust that my intentions are being received and the universe is putting things in motion for me .